Jerome A. Sinnen, “Jr.” age 80, passed away peacefully at Gables on the Pond in Random Lake on Sunday, November 27, 2016. Jerome was born in Belgium, WI on December 9, 1935 to Jerome and Josephine (nee Pierron) Sinnen. He was united in marriage to Nina (nee Stahl) Sinnen on April 27, 1957. Jerome was very active with the Random Lake Fire Department since 1960. He was one of four original EMTs in Random Lake and served as the Fire Department Treasurer. Jerome was a dedicated employee at Random Lake Wood Craft for 30 years and later retired from AJS in Random Lake. In his free time Jerome enjoyed bowling, fishing and watching various sports. 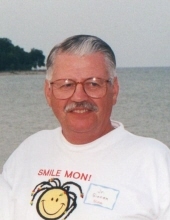 He was an avid Packer fan and would often be watching a game on the TV and listening to another game on the radio. He was a member of Our Lady of the Lakes Parish - St. Mary’s Chapel and participated in the choir for many years. Jerome is survived by his daughter Beth (James) Wolf of Fond Du Lac, sisters: Alicia(Donald) Nowack of Nekoosa, Geraldine Schowalter of Meza, AR, sisters-in-law: Gladys Sinnen of Port Washington, Donna Prinsen of Cedar Grove and Karen Wright of Sussex, brothers-in-law: Kenneth Stahl of Fort Wayne, IN, Russell (Carla) Stahl of Elk Grove Village, IL, Neal (Mary) Stahl of Rogers, MN, Dennis Witt of Winter. He is further survived by nieces, nephews and other relatives and friends. Jerome is preceded in death by his parents, wife Nina Sinnen, brothers: Norbert (Ruth) Sinnen, Roland Sinnen, sisters: Marcella (Alex) Schmitz, LaVerne (Clarence) Wetor, brother-in-law Herbert Schowalter and sister-in-law Valerie Witt. A Mass of Christian Burial will take place on Thursday, December 1, 2016 at Our Lady of the Lakes Parish - St. Mary’s Chapel, Random Lake at 6:00 PM. Father Richard Cerpich will preside. Visitation will be held from 4:00 PM until the time of Service at 6:00 PM. Jerome will be laid to rest next to his wife Nina the following day at 10:00 AM at St. Mary’s Cemetery in Random Lake. The family suggests memorial contributions to the Random Lake Fire Department (718 Spring Street Random Lake, 53075) or Our Lady of the Lakes Parish – St. Mary’s Chapel Random Lake (230 Butler Street Random Lake, 53075). Jerome’s family would like to extend a very special thank you to the caregivers at Gables on the Pond and Phil and Linda for the care and compassion they provided Jerome. To send flowers or a remembrance gift to the family of Jerome A. Sinnen, please visit our Tribute Store. "Email Address" would like to share the life celebration of Jerome A. Sinnen. Click on the "link" to go to share a favorite memory or leave a condolence message for the family.